Is treatment for a retinal tear needed? 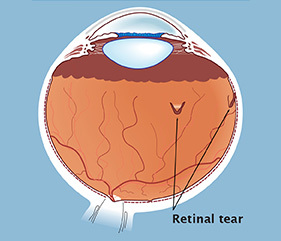 Usually treatment to seal a retinal tear is recommended to help prevent a retinal detachment. Laser treatment or freezing treatment, with appropriate anesthetic is used. The location and type of retinal break determine the choice. What symptoms can be expected after treatment of a retinal tear? The laser or freezing treatment does not eliminate the flashes and floaters, which may be present for weeks or months in the future. If there are many new floaters or the sensation of a dark curtain coming across the vision is noted, a new tear or a retinal detachment might be present and the eye should be examined again.